Form Description: The amount of exercise that you are able to get can have a huge impact on more than just your health. Generally speaking, the more exercise you get the better mood you will be in. One way to tell whether this is true or not is by keeping track of how you feel with this Mood and Exercise Log. Not only will you have space to keep track of the exercises you are doing, but also how they are impacting your moods. Just fill in the requested information, and you will be able to easily track how the different exercises that you do impact your moods. 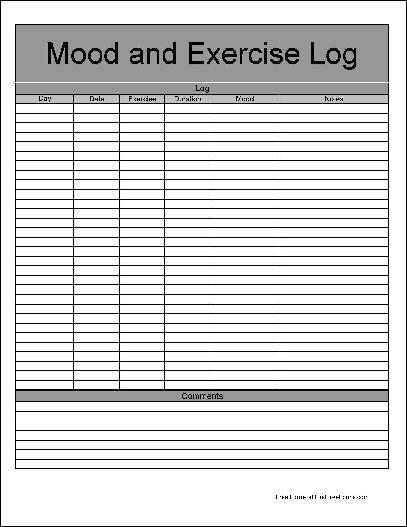 This form ("Basic Mood and Exercise Log") is associated with the following keywords: exercise, mood, log, tracking, personal, cardio, weights, endurance, basic.